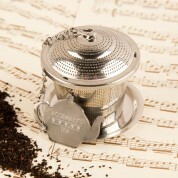 Our stainless steel tea infuser is the ultimate way to create the perfect cup of tea. 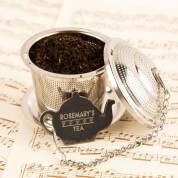 Place the loose tea inside and pop the lid on. Pace it in your favourite mug and enjoy the a strong, fragrant cup of your favourite flavoured tea! It even comes with a handy stainless steel drip dry tray, to avoid any mess when it is taken out of the mug. It features an adorable teapot charm, which looks gorgeous when hanging from the mug. 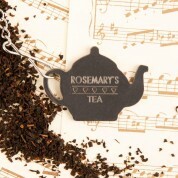 We engrave the tea pot charm with a name and cute heart design, giving it a special touch. We think it makes the perfect gift for a tea lover on their birthday or at Christmas, though it would suit any special occasion. It comes in an easy to wrap box. It is recommended you wash this item by hand. Dimensions: approx 5cm x 3cm.